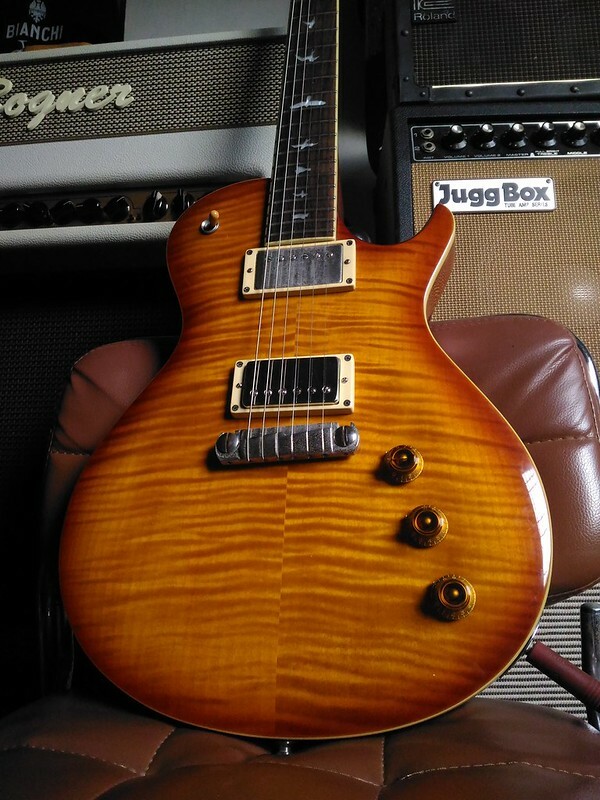 Hi guys.. PRS lovers.. if you don’t mind.. i want to ask where and how can i buy the “ PRS S2 Standard 22 (Satin Vintage Cherry) “ ? is there someone who takes online order? Or should i do it myself? I dont have any experince ordering online and very hesitant to do it because its too expensive if it fails from shipping.. thank you in advance..
Have you tried inquiring sa Lyric? I think i saw two S2 na stock sa ATC branch kahapon. You may want to check with them before ordering online. Orayts! Cool, Will do.. thanks! I have the 25th Anniv SE 24. It has the special stock pickups but can't be split. Since this might end as my go-to guitar, I want it to be versatile. Can anyone recommend a good split coil humbucker that is a good match for blues / classic rock play? Hopefully they are zebra color or at least silver soap bar. Looks are 50% of my criteria. Do you have a specific budget in mind for a set? As far as coming in zebra or having nickel/chrome covers, those are already aftermarket options that are not hard to find. 4-conductor lead wires are also a standard nowadays on aftermarket pickups. I'd look for something in the PAF or low-to-medium output territory if I were you. Depending on your budget, Dimarzio 36th Anniv PAFs are hard to beat for the price. I like SD Seth Lovers too but I wish they came with 4-conductor lead wires and a potted version. If you have the case to burn, there are also a lot from the boutique makers.. Bare Knuckle, Wolfetone, etc..
Sheptone Tributes are very good PAFs that come covered or uncovered in standard colors including Zebra, potted or unpotted with a price that s very hard to beat. You could also specify if you want them in 4-conductor wiring. I stopped searching for buckers for my SE after I had a set installed. I will certainly look this up. Thanks for the tips. This one now sports a Nailbomb in the bridge position. I'm still looking for a replacement bridge, and a good deal on lampshade knobs. ^ That guitar is really a looker! How did the pup change change the tone and character of the guitar? Coming from a Custom 5, the cleans are okay. i preferred the Custom 5 for cleans. For dirt, this one screams. I got to try a PRS Silver Sky sa Ishibashi Shibuya kahapon. I just wanted to feel the neck pero the store assistant was kind enough to let me plug it in to a Hot Rod Deluxe. - Magaan yung gitara. Feels like a toy. It probably weighs as much as the 12 string acoustic guitar that my dad owns. - Pickups sound great. It's like a cross between a single coil and a P90. - I didn't experience any "fret outs". So ok lang yung 7.25 inch radius nya. Although the thing about it's rosewood neck is parang glossed maple yung feel. Hindi "lumalaban" yung fretboard. I don't know if that's a good thing or bad. - Volume and Tone pots feel flimsy. - I didn't try the whammy bar. Hindi rin naman ako gumagamit nun. Overall...its a good guitar. Hindi lang talaga maiiwasan na ma compare sya sa Fender Strat especially with its price range. Yung PRS Silver Sky ay 240,000 Yen with tax. Yung Fender American Original (pumalit sa AVRI) ay nasa 210,000 Yen ata. Thanks for the info. Price is not bad for PHP120K. Time to start playing the lotto. Guys...280,000 Yen pala yung Silver Sky. Hindi 240,000 as earlier mentioned. Pumunta ulit ako Ishibashi kanina to try out a used CE 24..yung naka rotating pickup selector pa. That one i really dig....kaso wala akong 160,000 Yen. malaki ba diff ng Big Dippers from the Jazzy Cats? Can't find a direct A/B. Problem with the Big Dippers, there's no aftermarket set. Either you buy a JM sig or wait for someone to part it out. The Jazzy Cats are supposedly the closest you can get to the Big Dippers from the aftermarket pickups. I've tried the Jazzy Cats on numerous occasions and it hits that woody mid-scooped tone really well. Instant JM thru a Blackface amp and 808.